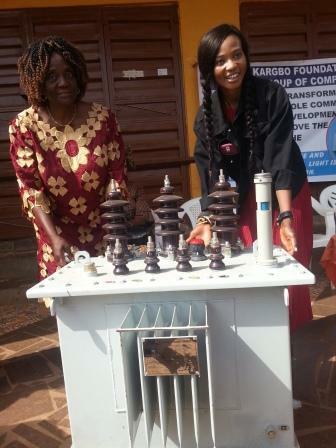 In marking International Women’s Day 8th March 2017, Mariatu Kargbo Foundation and Global Group of Companies have donated a transformer to the Devil Hole Community. The donation of the transformer has paved the way for residents of that community to enjoy electricity for the very first time and it is also part of Maria’s development initiatives to improve the livelihood of that community. The Chief Executive Officer of the Foundation Madam Mariatu Kargbo aka Maria pointed out that the people of Devil Hole know the importance of light. She said light brings peace and love while darkness symbolizes problem. She explained that she was very happy to see light in that community which is a sign of unity, love, peace and good fortune. She thanked God for giving her the courage to help the people of Sierra Leone. She also thanked President Ernest Bai Koroma for his support he is rendering her by making her very proud anywhere she goes. She thanked the Government and people of China for their support towards her and people of Devi Hole Community. Maria said the respect President Koroma is showing her, cannot be compared to anything that she wants in life, as the President is supporting and promoting development initiatives. Maria stressed that she is not a politician but she is looking up to someone that can bring good initiatives and support to the people of Sierra Leone. 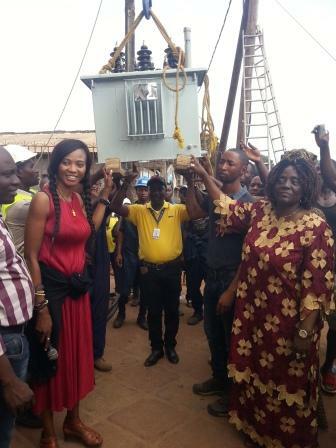 Devil Hole Community Chairlady, Mariama Sesay expressed her joy for such venture taken by Maria. According to her nobody has ever come to their aid for them to have access to electricity except Maria. She said they were yearning for light all these years but now Maria has made it possible for them. The chairlady called on the Government of Sierra Leone to work hand in hand with Mariatu Kargbo for her to be happy and for her to do more for them. “Maria loves the people of this country by helping different communities to grow in one way or the other.” She said the Honorable in the community is not contributing to any development and they really appreciate Maria for her good work. Devil Hole Section Chief, PC Pa Alimamy Conteh said he felt very happy to see their community light up through Maria’s support. He said the International Women’s Day this year is a remarkable day in the history of Devil Hole Community. He said if they have five of this kind of women in the community, their community will be among the top powerful developing communities in the country. Agnes Sesay a form two pupil from the Harvester Secondary School said they were struggling to study at night and they felt very happy to see their community light up for the first time. The event was witnessed by the elder sister of President Koroma and other top dignitaries.